Teal Flamingo is a fashion and salon shop located in Northeast Portland, OR. Protocol Three built a beautiful responsible website with themed colors, social media integration, and Schedulicity appointment manager. Adam, with Protocol 3, was a dream to work with. 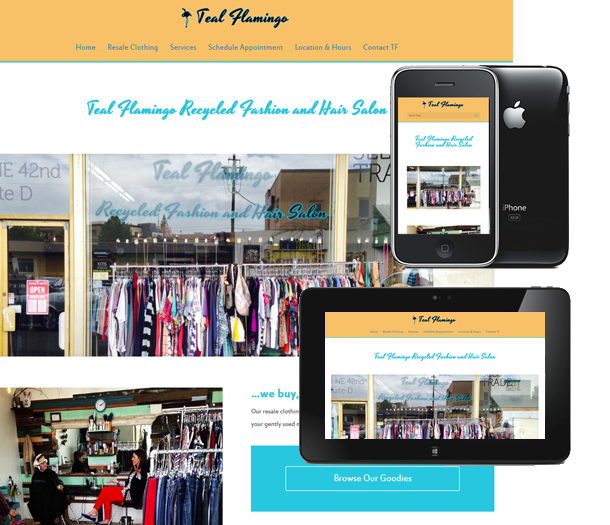 He was attentive to my business’ needs and able to achieve Teal Flamingo’s wants in a website. He was active in changing minute details in a timely manner. I will and have recommended Adam to new business owners and established business owners. Teal Flamingo looks forward to continuing a relationship with Adam and Protocol 3. TealFlamingoPDX.com is a fashion and salon shop located in Northeast Portland, OR. Protocol Three built a beautiful responsible website with themed colors, social media integration, and Schedulicity appointment manager.